Nationally known local artist Emily James has chosen 5th Avenue for her gallery as well as her painting studio for the past 10 years. 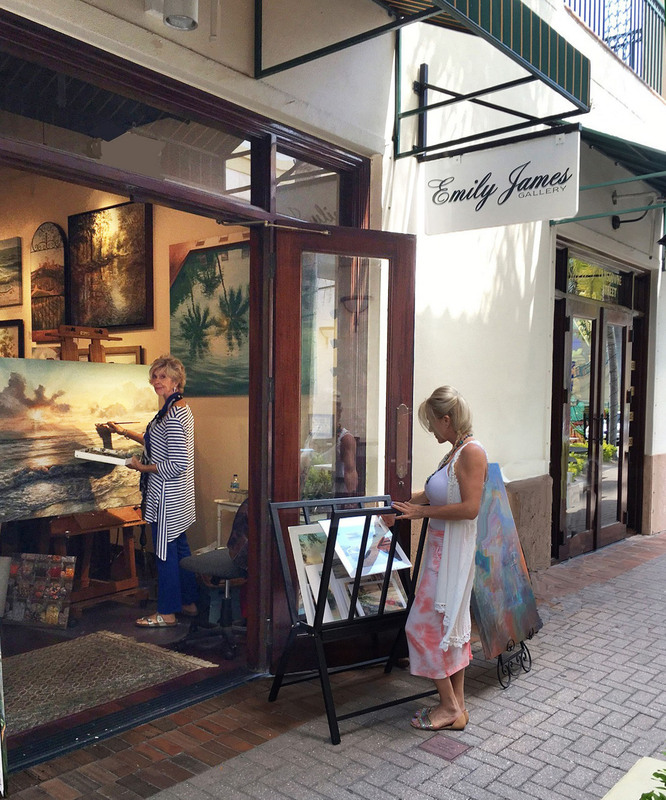 A native Floridian, Emily’s gallery is located in the heart of Naples in the Vergina restaurant courtyard, across 5th Avenue from Sugden Theater. Known for her versatility in both subject and style, she enjoys painting landscapes, seascapes, abstracts, and portraits, and specializes in custom artwork in the subject and size for the owner to enjoy. With her acrylics and oils on canvas, Emily has received numerous Best-in-Show ribbons, and has had many one-woman shows, one of which sold out before it officially opened. With her watercolors, she is a signature member of the Florida Watercolor Society, accepted into Watercolor U.S.A., and featured in the book, The Best of Watercolor. Emily is also the only artist in the United States selected by the top three fine art publishers, and two of her images have been among the top 50 selling prints worldwide. She was also selected as the official artist of The Masters Golf tournament. In addition, she has exhibited at the High Museum in Atlanta, and selected as an Outstanding American Woman in the Arts. Her alma mater, Florida State University, recently asked her to join the Dean of Art’s Advisory board, with the Dean commenting, she is a “visual artist who continues to create art with passion and dedication”.